High King Wulfharth (also known as Ysmir, Dragon of the North, Breath of Kyne, Shor's Tongue, the Grey Wind, the Storm of Kyne, the Kingmaker, the Ash-King, and possibly the Underking) was an Atmora-born High King of ancient Skyrim who came to power after the death of Hoag Merkiller at Glenumbria Moors. He submitted Skyrim to a fiery reinstatement of the traditional Nordic pantheon, destroying Alessian temples and forcing the remnants of its priesthood to seek refuge in the Heartland. He was also famed for driving the Direnni clan out of Skyrim. Legends claim that an evil god once made him (and all of Skyrim) into children, and when Wulfharth found a way to cure his people, he inadvertently made himself extremely old and died (for the first time). He led the invasion of Resdayn (modern-day Morrowind) and fought at the Battle of Red Mountain, where he was killed again. One theory (heavily implied by legends) to explain this unusual ability to cheat death suggests that Wulfharth was not a mere man, but one of a series of avatars sent by Shor—the Shezarrines. Arguably included among these avatars would be Hans the Fox and Pelinal Whitestrake, among others. The theory claims that Wulfharth reincarnated or recurred, as Shor's avatars are wont to do, as the Ash-King, an undead warrior bent on destroying the Mer and ruling Tamriel. Most of what is written about the early lives of King Wulfharth comes from ancient Nord legends collected in Five Songs of King Wulfharth. His (purportedly autobiographical) story continues in The Arcturian Heresy, though the veracity of these works cannot be determined (and in one instance, two contradictory versions of the same story exist). There are many tales of Wulfharth's deeds as High King, both mundane and mythical. It is said he rid Skyrim of the Direnni, fought the eastern Orcs and defeated their chief with a shout, and even swallowed a thundercloud—a deed which earned him the name Breath of Kyne[nb 3]. However, particular attention is given to the tale of his death. The Orcish god Orkey, the Old Knocker, summoned the ghost of Alduin the Time-Eater, who ate the Nords down to six years old.. Wulfharth summoned the ghost of Shor to fight Alduin, and in the process learned a new thu'um to restore the Nords to their proper ages. Unfortunately, while using this shout, the High King advanced his own age too far, and died. The tales say the flames from Wulfharth's funeral pyre "reached the hearth of Kyne itself." The tales of King Wulfharth pick up again about a century later. As with most stories of the Battle of Red Mountain, the Nordic account presents a unique cultural take on events. However, the Devil of Dagoth had betrayed the Nords; the Heart of Shor wasn't in Resdayn, and had never been. Once Shor and his armies reached Red Mountain, the combined armies of the Dwarves and Devils attacked and slaughtered them. Devil sorcerers "lifted the mountain and threw it onto Shor", trapping him there for all time. Wulfharth was able to slay the Dwemer King Dumalacath (Dumac) the Dwarf-Orc, but was himself blasted back into ash by the Devil Vehk (Vivec). It is said that Kyne lifted Ysmir's ashes back into the sky to remind the Nords to never again trust the Devils. "Many Nords could not bring themselves to ally with their traditional enemies, even in the face of Red Mountain. They were close to desertion. Then Wulfharth said: "Don't you see where you really are? Don't you know who Shor really is? Don't you know what this war is?" And they looked from the King to the God to the Devils and Orcs, and some knew, really knew, and they are the ones that stayed." An apocryphal version of the events at Red Mountain also exists, purporting to be "the truth." In this account, Voryn Dagoth had not lied about the Heart of Shor; it was in Resdayn. However, as the Nords massed at the edge of the Inner Sea the Chimeri armies had only just left Narsis, apparently delaying their march. According to Dagoth, the Chimer were moving so slowly because the Tribunal believed that peace with the Dwemer would ruin their way of life. They had betrayed Nerevar's trust, and sent Dagoth to Skyrim to find Lorkhan (as Shor) so that he "might wreak vengeance on the Dwarves for their hubris." In the climactic battle, Shor and his generals met the Kings Nerevar and Dumac, and Nerevar's shield-companion Alandro Sul. At some point, Shor had been able to regain his Heart but remained in a weakened state; Nerevar and his companions each wielded one of Kagrenac's Tools. Sul felled the Ash-King, but not before Wulfharth was able to shout his opponent blind. Dumac managed to strike Shor in the Heart with Sunder, making it solid, before being killed by Dagoth. Upon seeing his friend struck down, Nerevar slew Dagoth, but was mortally wounded by Shor in the process. As he lay dying, Nerevar managed to strike at the god and cut out his Heart with Keening. The death of Shor brought an end to the battle, and the song ends there. The story of the Ash-King at Red Mountain concludes in The Arcturian Heresy. Some time later, Wulfharth came to and staggered out of Red Mountain to earthquakes and a land on fire—the eruption of Sun's Death. The Ash-King could not maintain his mortal form with Lorkhan dead (again); he reverted to ash, and the wind bore his remains back to Skyrim. Following the death of Lorkhan at Red Mountain, Wulfharth had changed; he was no longer a Nord (or Atmoran), but something else entirely, sometimes appearing as a storm cloud. His motivations had changed as well, consumed with a desire to kill the Tribunal. The Nords called Ysmir's new incarnation the Grey Wind, the Storm of Kyne. At some point in this period, Ysmir the storm led another invasion of Morrowind. However, the Dunmer and their new gods, the Tribunal, had grown too powerful, so Wulfharth went to sleep underground for a time to reform his body and regain his strength. 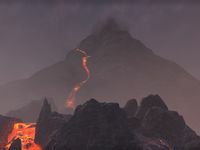 Wulfharth was reawakened and returned to Tamriel in 2E 572 to assist in repelling the Kamal king Ada'Soom Dir-Kamal at the Red Mountain, when he attempted to conquer Morrowind during the Second Akaviri Invasion. Some sources say the Greybeards summoned the Ash-King from Sovngarde, to fight at Jorunn the Skald-King's side against Dir-Kamal. Others claim, oddly enough, that he was summoned by Almalexia herself to assist his hated enemies, the Tribunal. These sources also give Wulfharth a new title—the Underking. After the battle, the Underking went back underground to sleep again for nearly three centuries. The Underking was an undead entity widely known and feared throughout Tamriel in the Third Era, though most sources state that in life, he was Zurin Arctus, Imperial Battlemage. 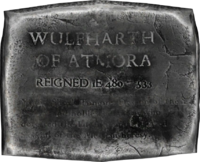 While most of Wulfharth's claims in The Arcturian Heresy run contrary to the accepted historical record, some details are corroborated by other sources. Near the end of the Interregnum, Wulfharth the Underking was awakened by the Greybeards, who spoke a prophecy—a new Emperor would come to defeat the Elves and unite Tamriel under his rule. 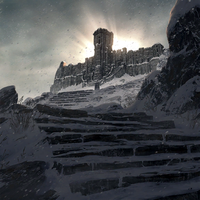 Given his goal of destroying the Tribunal, Wulfharth traveled to High Hrothgar to see if he was the chosen one. He was not. When the Greybeards spoke, their voices blasted his body to ash again. As the ashes scattered, the Greybeards warned Ysmir to beware of betrayal. The prophesized one was a young Breton named Hjalti Early-Beard, a warrior from the island kingdom of Alcaire in High Rock, who would one day rule Tamriel. [UOL 1] He was a general, leading the armies of Cuhlecain, King of Falkreath in the Colovian Estates. One night during the Battle of Old Hrol'dan, Wulfharth appeared to the general as a storm and allied with him. At dawn, Hjalti led an assault of Colovian troops and their Nord berserker allies, protected from enemy arrows by the whirling winds of Ysmir. He then shouted down the walls, which allowed his forces take the town. After this victory, the Nords dubbed Hjalti Talos, meaning "Stormcrown." With Ysmir's counsel, protection, and thu'um at his disposal, Hjalti was invincible; Cuhlecain's armies were able to conquer West Cyrodiil in under a year. The Eastern Heartlands were next, and were taken in 2E 854. Cuhlecain prepared to be crowned Emperor, but he and his loyalists were assassinated—on Hjalti's orders. 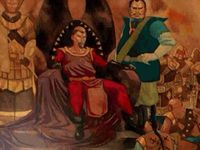 Instead, the general had himself crowned Emperor of Tamriel, taking tthe Cyrodiilic name Tiber Septim. The conquests continued, and eventually only the Elven lands remained apart from the Empire. Wulfharth reminded the emperor of his destiny, and advocated for a full-scale invasion of Morrowind to crush the Tribunal, steal their power, and use it to conquer Lorkhan's oldest hated enemies, the Altmer of the Summerset Isles. However, the Empire and Morrowind instead agreed to an armistice, which allowed the Dunmer to retain their religion and way of life. The Underking believed this to be the betrayal the Greybeards warned him of, and abandoned the Empire in disgust. However, that betrayal was yet to come. As part of the Armistice, the Tribunal gave the Empire Numidium, a colossal Dwemer construct. The automaton didn't function, so Tiber Septim tasked his Imperial Battlemage, Zurin Arctus, with repairing it. Arctus pored over ancient Dwemer plans, and discovered that Numidium was a fearsome weapon powered by the Heart of Lorkhan. He also learned of events surrounding the Battle of Red Mountain, of the Underking's involvement, and of his divine nature. But the plans he had were incomplete, and Arctus deduced (incorrectly) that the "heart" of Lorkhan referred to the deity's life force—and by extension, that of Wulfharth, Lorkhan's mortal avatar. Most importantly, he knew how to harness that power. Arctus reported this news to the emperor, and Tiber Septim realized Numidium would enable him to conquer the elves and fulfill the prophecy. The plan still required the Underking's "heart," so the Emperor and his Battlemage set a trap. 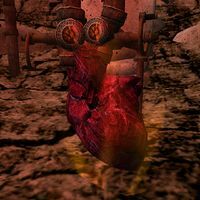 Meanwhile, the estranged Underking had discovered why Morrowind's Tribunal had so readily agreed to the Armistice—they were cut off from the Heart of Lorkhan. Dagoth Ur had returned after centuries of sleep beneath Red Mountain and taken control of the Heart Chamber at the mountain's core. He planned to use the Heart not only to make himself a god, but to conquer Tamriel by constructing a second Numidium. When word came the Empire needed him back, Wulfharth complied, as he would need its armies to combat the new threat in Morrowind. Upon returning to the Imperial City, the Underking was ambushed by Zurin Arctus and the Imperial guards. The Battlemage cast a soul trap spell on Wulfharth, and as the Underking was cut down his divine heart was sucked into a massive soul gem, the Mantella. However, as Wulfharth's soul was transferring to the Mantella, it tore a hole though Arctus' chest, killing him. The Underking reverted to ash once more. When the Elder Council arrived, Tiber Septim told them Zurin Arctus had been killed while attempting a coup; the Underking and the fallen guards were hailed as heroes. 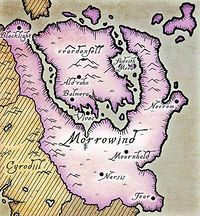 While the Underking was "not exactly Lorkhan", his heart was sufficient to power Numidium, and in 2E 896 it was used to conquer the Summerset Isles, fulfilling the prophecy of a united Tamriel. However, shortly after the battle was won a "rotting, undead wizard"[nb 6] appeared in the sky and attacked Numidium; both were apparently destroyed in the process. Tiber Septim declared the start of the Third Era and ruled for nearly four more decades. Shortly after Tiber's grandson Pelagius I took the throne, he was visited by the Underking, who explained he'd been sent by Tiber Septim to help the new emperor run the empire. For more information on the Underking in the Third Era, see his Lore article. ^ The Battle of Glenumbria Moors, after which Wulfharth is said to have to taken the throne, is dated to 1E 482, but Wulfharth's reign is said to have lasted from 1E 480 to 1E 533. 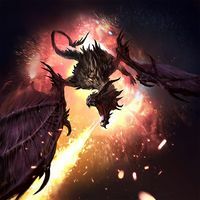 ^ The title "Ysmir, Dragon of the North" has been bestowed upon several individuals besides Wulfharth, notably Tiber Septim and the Last Dragonborn. 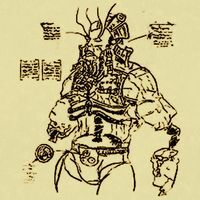 ^ The title "Breath-of-Kyne" is also attributed to the First Era demigod Morihaus. ^ Other accounts of the Battle of Red Mountain date to on or around 1E 700. ^ The "rotting, undead wizard" was the Underking, but it is not known whether this was another incarnation of Wulfharth or the reanimated corpse of Zurin Arctus (or something else entirely). This page was last modified on 23 January 2019, at 23:08.